The former Beverly branch of the Chicago Public Library has been vacant since 2009. 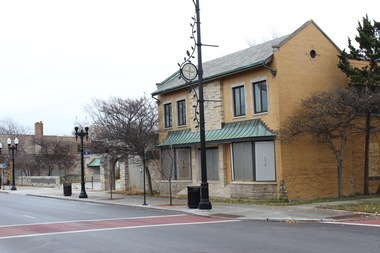 Barraco's is interested in the site as a potential banquet hall but needs a liquor license, Ald. Matt O'Shea (19th) said. BEVERLY — The owners of the Barraco's Italian restaurant chain appear to be on their way to opening a banquet hall on 95th Street now that enough neighbors have signed a petition to lift the ban on alcohol sales on the property. The stretch of 95th Street that runs throughout Beverly has been "dry" since Prohibition. Barraco's was hoping to change a small parcel in order to open a banquet hall in the former Beverly branch of the Chicago Public Library. The building at 2105-2221 W. 95th St. served as the neighborhood library from 1981-2009. But the limestone structure has greatly deteriorated over the years, according to Ald. Matt O'Shea (19th). Barraco's has committed to investing upward of $1.7 million into the vacant building that was originally constructed as a funeral home. To justify the expense, owner Nick Barraco said his family needs to be able to serve alcohol. The family-owned chain believes the proposed banquet facility will have capacity for about 185 people when complete. Barraco's would mostly cater to funeral luncheons, birthday parties, showers and small weddings, the potential owner said. There are 92 registered voters in the area from 95th and 97th streets, between the east side of Hamilton Avenue and the west side of Hoyne Avenue. Two thirds, or 62 voters, need to sign a petition in order allow the sale of alcohol at the site, O'Shea said. A meeting Tuesday night at Ridge Park began with O'Shea having collected nearly enough signatures to change the rule. Meeting this requirement allows for the sale of liquor only on the south side of 95th Street between Hamilton and Hoyne Avenues, the alderman said. After the meeting, the alderman's staff had secured the signatures required to meet the threshold. But O'Shea said he hopes to have even more signatures before submitting the petition as both a strong show of support as well as an added insurance measure. "I feel very comfortable with this land deal," O'Shea told a group of about 40 homeowners attending the meeting. Several in the audience had questions about the proposed banquet hall, but the vibe seemed positive overall. O'Shea began the meeting by laying out the existing rules governing the sale of alcohol on 95th Street. He said sometime in the 1930s the area was voted "dry." The only way to change this is a ballot measure or via a petition. He opted for the petition and said he's personally met with most neighbors in the area who ultimately will decide the issue. Some were concerned about the sale of alcohol, others were worried about the impact the business would have on parking and traffic along with issues like noise, hours of operation and even garbage pickup. The restaurateur plans to enter into a long-term lease agreement with a city-owned parking lot at 9448 S. Pleasant Ave. to quell traffic-related issues. Barraco's valet service would use the lot, and the restaurant chain would have an option to buy the property should all go well. Barraco also addressed other the concerns at the meeting, adding that his family has a 35-year history of being a good neighbor and operating a quality business. O'Shea said this track record helped sway his opinion along with Barraco's successful debut in Mount Greenwood in May 2014. O'Shea added that the proposed banquet hall also helps counter the blight along the once-busy retail stretch of 95th Street. He said there is a 20 percent vacancy rate along the strip, and he believes Barraco's could help breathe new life into the area. That said, O'Shea remained adamantly opposed to doing away with the "dry" spell on 95th Street for good — insisting on a piecemeal approach with a specific user and a specific address in mind. "I do not support a blanket vote of wet on 95th Street," O'Shea said.